Pork hocks with chestnuts is a savory dish with a very simple cooking procedure and few simple ingredients. This is a good addition on Christmas celebration since roasted chestnuts are only abundant during Christmas and New Year but some times you can see vendors selling these during ordinary days or months. If you can find canned chestnuts, then I think that will be alright to use just don’t be confused buying the canned Chinese water chestnuts. They are not the same because the water chestnut is not a nut but an aquatic vegetable. 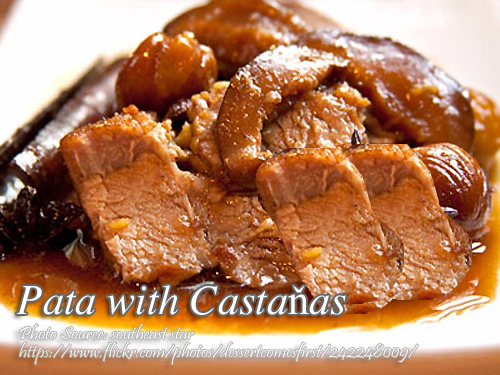 To cook pork hocks with chestnuts; Clean pata well and put in a bowl with the baking soda and enough water to cover. Let to stand for a few minutes, rinse well to remove soda and drain. Return to the bowl and add the marinade. Let to stand for at least 2 hours. Put pork and the marinade in a casserole. Add about 1 1/2 cups water. Bring to a boil and then simmer till pork is tender for about 2 hours. Correct seasoning and add castaňas. Simmer for another 5 minutes. Clean pata well and put in a bowl with the baking soda and enough water to cover. Let to stand for a few minutes, rinse well to remove soda and drain. Return to the bowl and add the marinade. Let to stand for at least 2 hours. Put pork and the marinade in a casserole. Add about 1½ cups water. Bring to a boil and then simmer till pork is tender for about 2 hours. Correct seasoning and add castaňas. Simmer for another 5 minutes . Serve hot.